The only machine quilting (walking foot) I've done so far is on some donated wheelchair lap quilts. (I have several tops of various sizes ready to quilt, however.) I found that starting in the middle and sewing out was a real pain in the tush, as I had to tie all those thread ends and bury them. That took more time than the sewing. By the second or third line, I was ready to try sewing side to side to see if I got any puckers. Fortunately, I didn't. They quilted perfectly going side to side. The lap quilts were spray basted, but really small. Is there some magic solution to this problem? Is, "start in the middle" just an old wives tail? Is puckering more likely in larger quilts? How much larger? (I have two play quilt tops ready to go that are in the 50 X 60 range.) Is it just trial and error? Is there some easy way (read quick) to tie the thread tails? Or, even better, a way to do it that that the ends don't have to be tied? I'd hate to have to rip out a lot of quilting because of a pucker, but I think machine quilting a twin size quilt and tying all those thread tails would make me swear off quilting forever. I only did one quilt with straight lines that started on one side and quilted to the middle, I then thought there was very little movement so I would turn the quilt and start at the side again and quilted in, big mistake. I ended up taking the second side of quilting out because I had a puffy strip of backing in the center from the backing moving, it wasn't terrible but it was a small quilt so I fixed it by quilting the second half from the center out. I do straight line quilting from the center out. Had a big post typed and hit something while editing and lost it all. Last edited by anne2016; 12-18-2017 at 08:40 AM. The ones I did were on the diagonal. At first, I started in the center and went one way and then came back to the center and went the other way. After tying those thread ends, I just started at the edge and went all the way across. Bkay I hate thread tails, so here's what I do - I take a back stitch or two at the beginning and end and cut my thread tails. I don't make show quilts so no one has ever looked closely enough at my quilts to notice. BTW - I do this with my domestic machines and my long arm. No shame in my game. hhmmm ... I don't start in the middle. 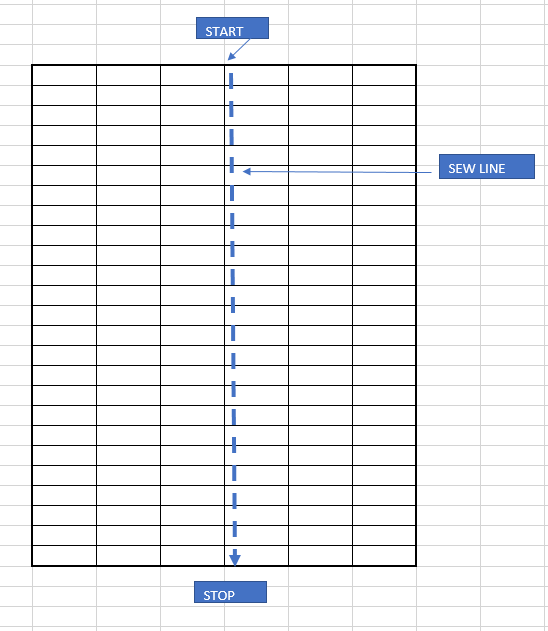 I may start on my first middle line for straight line quilting, but I just start on one end at the edge of the border - back-stich then just sew all of the way across to the other side then back-stitch again at the edge. maybe I have been doing it wrong, but its been working. I think the "start in the middle" plan originates from hand quilting, where the fabric may "take up" as you quilt, and as you move from the centre out, you lessen the chance of pleats or puckers. For straight line quilting I often start at the edge (centre of quilt), and go across. Then I go to the top and do a centre line of top to bottom etc. As long as it's well pinned or basted, and I work alternating across with up/down, I've had no problems. Quilting from the middle out originated with hand quilting in a hoop. The reason for this was to ensure that any fullness got moved out to the edges of the quilt rather than pushed to the center, for obvious reasons. Even in those days, however, frame quilters did not quilt from the center out, but rather from the edge in. I personally would never machine quilt straight stitching from the center out. It is not necessary unless (1) you have a machine that cannot be adjusted to feed the layers evenly, and/or (2) you do not prepare the quilt sandwich in such a way as to make it very stable. Regarding the machine, honestly most machines can be adjusted to feed a quilt sandwich evenly. My Bernina will do it even without a walking foot. Many machines, however, will require a walking foot and some machines will also require some adjustment to the presser foot pressure. My Bernina does not allow for presser foot pressure adjustment, but then it is good at adapting to different thicknesses. I should add one caveat to my recommendations, and that is that everything I mention might be insufficient if you are using an extremely high loft batting and/or you are quilting a very large quilt, such as queen or king size. Most people avoid extremely high loft batting anyway, so this is largely a non-issue. For a very large quilt, what I mention should still work if you are careful, and in that case I would also recommend using one of the methods for splitting up a large quilt on a domestic sewing machine (such as splitting up the batting, but there are other methods too). The whole point is to prevent fabric from creeping ahead of the presser foot, and from letting any of the 3 layers shift while you are sewing. Stabilizing your top and backing before sandwiching will help a lot with this, and using a stable basting method will also help a lot. For the backing, I recommend heavily starching before you start layering. I like a 1:1 solution of Sta-Flo and water, which is a much heavier starch solution than spray starch. What this heavy starch does is stabilize the backing so it will not stretch or distort while you are quilting. For the top, I recommend doing several layers of spray starch. Ironing dry between starchings can be a lot of work. It's fine to just mist the entire top (laying it out flat on an oversized flat sheet is good) and allow the spray starch to dry between mistings. A fan will help speed the drying. Again, the starch stabilizes the fabric in the top so it is much less likely to stretch or distort while you sew. Basting method can make a huge difference. Spray basting binds all 3 layers together continuously, unlike pin basting. I have not used it myself, but glue basting also offers the opportunity to bind all layers together continuously. Just be sure with glue not to have large areas without glue and other areas with big globs of glue. Spray basting and glue basting stabilize the quilt sandwich so that layers are not able to shift while you sew, and they also help to keep the top and backing fabric from stretching under the presser foot. The larger the quilt, the more important it is to use all of these methods for stabilizing the quilt sandwich. The machine is also extremely important. You can kind of tell by looking if a machine is not feeding layers evenly. If you have a suspicion that the presser foot is pushing the fabric ahead, chances are it is. A good test would be to prepare a quilt sandwich using fabric that has been washed (to remove factory sizing) but not starched, and a high loft batting. I would make this at least a yard square (larger is even better) and do cross-hatching on it. Chances are good you will get puckers where the lines cross. Try again with the stabilization methods I mention, and chances are good you will not get puckers. If you do, your machine needs adjustment (or you need a different machine). Edit: Sorry this got so long. Last edited by Prism99; 12-18-2017 at 02:02 PM. Yes, I remember my grandmother's quilting frame. I can remember my grandmother, mom, aunts and older cousins sitting on two sides of the frame - quilting and talking. They definitely were quilting from the outside in. All Grandmother's quilts were quilted in the "Baptist Fan" motif. Thanks, Prism, for the fun memory. Thanks, everyone. I'm not quilting for show, either. So, I'll keep spray basting, start starching and backtacking. I usually stabilize the quilt by stitching in-the-ditch around the outer borders first. Then I stabilize half way between the outside and middle. Then things are pretty stable for the rest of the quilting. I'll do all of the stitch-in-the-ditch before adding free-motion or ruler work. I do like to spray baste. But you've absolutely got to baste the raw edges together around the outside for the spray baste to hold. I do add some safety pins if the quilt is bigger than 45" square. For straight line quilting I start from the centre simply to reduce the amount of quilt in my harp space. I go from the centre out to the edge, turn the quilt around and do the same again. I would rather go from one side to the other...seems more logical but even with the large harp space of the 710, i just can't comfortably fit all of a quilt through. I don't spray baste, have tried 505 numerous times but it never really adheres well to my wool/poly batting and I was getting shifting around of the top whilst quilting. I am now back to my 500 quilting pins and feeling my quilts are more secure. Bkay, I learned from Lori Kennedy to not tuck in those threads but to take a few tiny stitches at the start and end. So much easier than the other way and if it's not going to be judged, which mine aren't who cares. Lori makes wonderful quilts and I've learned a lot from her blog The Inbox Jaunt. I'm new at FMQ and this works great for me. Thank you, Prism99. This is the best explanation I have seen of fabric creep while quilting and how to stabilize the quilt. Much appreciated. I have not done straight line quilting. I spray baste my quilts & "scribble" across the quilt edge to edge. I do start in the center & then work 1 side to the edge. Then start from the center & work to the other edge. I generally do twin size & smaller but have done this on a queen size for myself & it worked fine, no puckers.